We were a bit surprised, but should we have been? With each passing day, the influence of digitization and technology reaches deeper and deeper into every part of our lives. With Silicon Valley leading the way, it’s perhaps only natural that their once-tech-centric management methods are finding new applications amongst us “people-centric” people. Scrum may have once been a method used solely by development and IT teams to manage their work, but it has emerged as a concept that can also drive efficiency in Internal Communications, HR, and marketing. 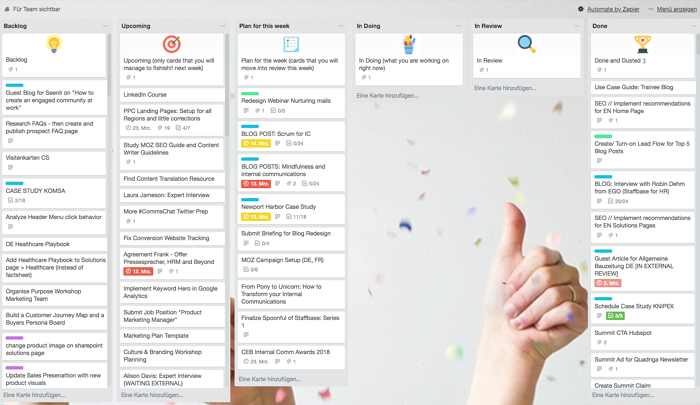 These days, if you’re looking to jumpstart the way your team gets work done, search no longer. Use Scrum! Still confused? Okay, let’s take it from the top. Simply put, what that means is that Scrum is a way to organize teams and work together. Until recently, the method was most commonly used by digital developers, but it is quickly moving into other departments. For example, Philanthropy Northwest, a network of philanthropists who build communities based on diversity and inclusion, is testing Scrum as a way to improve teamwork amongst their internal communications department. At Staffbase, we use Scrum in several different departments, including Marketing, to stay on track with our projects. 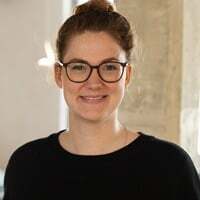 To make this process work for Internal Communications, let’s have a look at the basics, with examples drawn from how we implement the method at Staffbase. There are four parts to a Scrum process: Sprint Planning, Daily Stand-Up, Sprint Demo, and Sprint Retrospective. Sprint Planning: Sprint Planning is the foundation of Scrum. A Sprint is the time frame you determine your team will take to complete an upcoming task. Sprints are typically between two and four weeks long, depending on the number of tasks your team needs to tackle. In our marketing team at Staffbase, we work in one-week sprints; in development, there are two-week sprints. Your team sets the time frame that works best for it. Here’s how it works: The team meets on the first day of the sprint and discusses or prioritizes the upcoming tasks which they aim to finish during the assigned period. In the Staffbase marketing department, we meet every Monday and decide what we will write, post, and design. These tasks then have to be finished by Friday. It’s not rocket science, but it’s extremely helpful because there’s no chance to drag along tasks that you don’t really fancy doing. And we’ve all had those. Daily Stand-Up: In order to keep up with personal tasks and address any issues that arise, there’s a Daily Stand-Up. A Daily Stand-Up is generally a 15-minute meeting in which each team member reports on their current progress (or lack thereof). Our development team holds a traditional stand-up everyday at noon, there are other options though. For example our product team has a reminder set that they write a short report every day at 2 p.m.autonomously. Sprint Demo: The Sprint Demo is the last meeting of the week. At Staffbase, we hold our Sprint Demo meetings on Friday afternoons to talk about our completed work, examine the status of existing projects, and celebrate accomplishments. 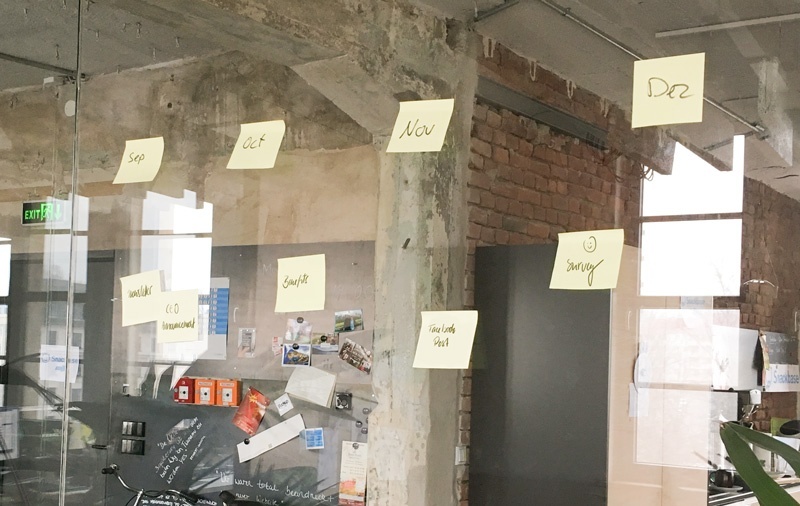 The Sprint Retrospective: The Sprint Retrospective often aligns with the Sprint Demo and is a review of what went well and what went wrong for the week. The aim is to ensure constant improvement and to avoid repeating mistakes in the future. Ideally, things that went wrong will be discussed, and solutions will be developed. There are six different rows on our Trello Board. This is what the board should look like on Monday: The “Backlog” on the left is full of ideas we plan to realize in the future; the “Upcoming” tasks are the qualified ideas we plan to tackle within the next month or two. “Plan for the week,” “In Doing,” and “In Review” are currently empty. “Done” holds all completed tasks. 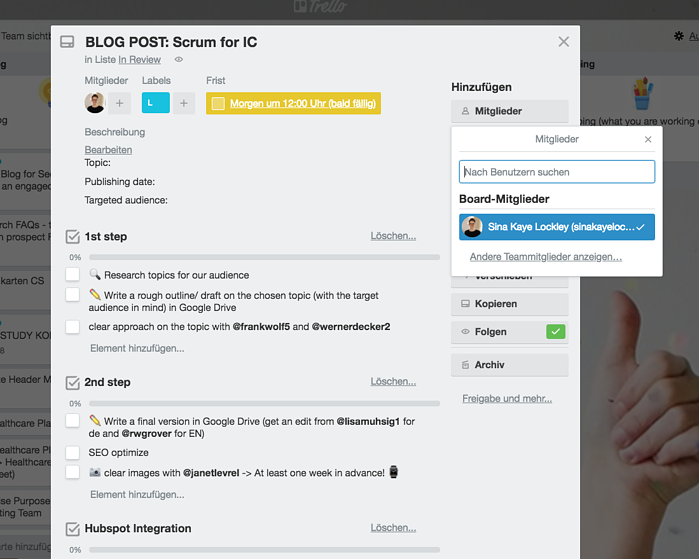 In the Sprint Demo and Retrospective the board goes back to its original version from Monday. 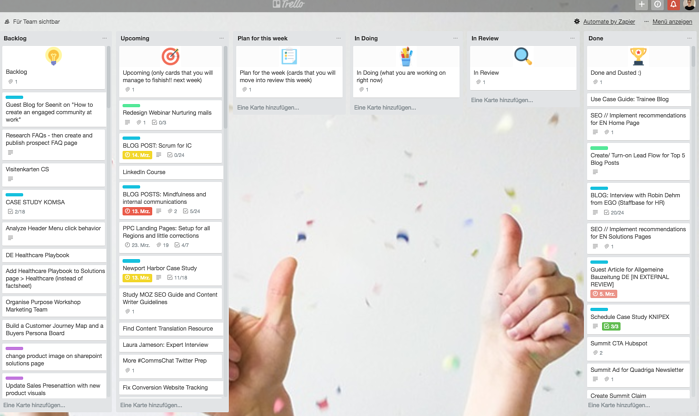 Trello is just one approach to visualizing Scrum. In small teams that don’t work remotely, a blackboard or even just a wall with Post-it notes would work just as well. The advantage of Trello is that every card can be assigned to an owner (or owners) and accordingly labeled. The owner is the person responsible for the upcoming task, and the label indicates the size of the task. For example, for this blog I was the owner of the task; the label is a large because I will spend much of my week writing this piece; and the card lists specific steps I have to take in order for it to become a finished blog. It’s my responsibility to move this card to In Review within a week. 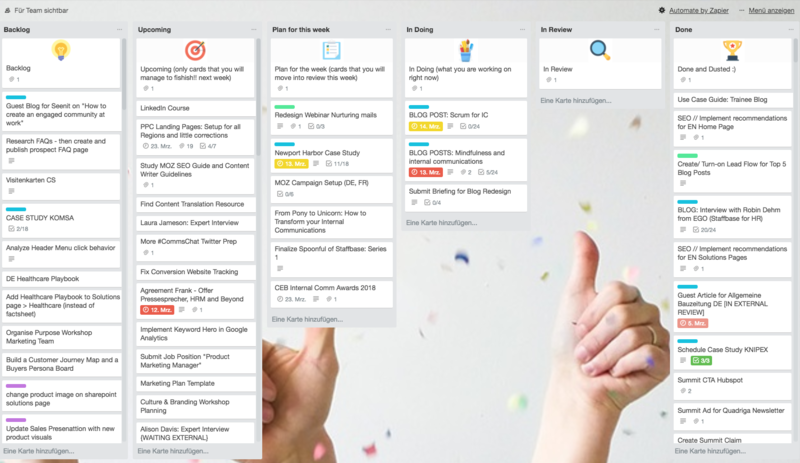 For Internal Communications you might have tasks like Social Media posts, Newsletters, Website Improvements, etc., that would all find a place on your Scrum Board. To really drive efficiency and take the process to the next level you can assign the labels mentioned above. 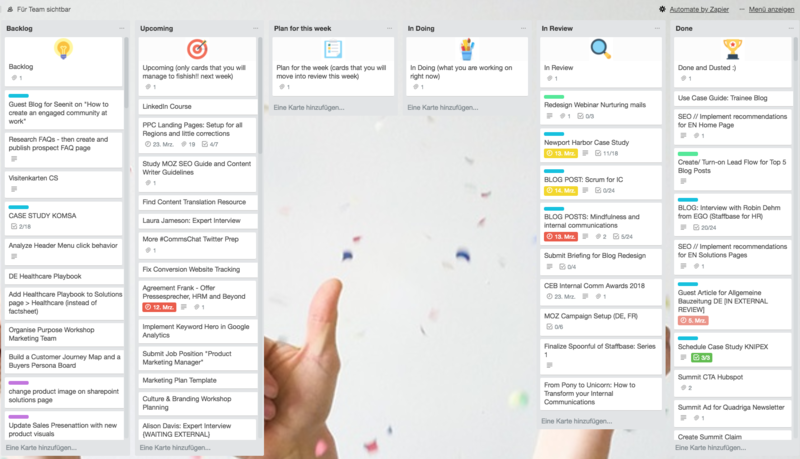 Then you can decide how many tasks of a certain size your team can manage within the week, ideally increasing the number and size of tasks over time. Of course, no process can move forward without people driving it. Here are the official titles used in Scrum. The Product Owner: The Product Owner is the ninja of the product and the person who has the best overview of the product or service you offer. This is the person who drives development with the bigger picture in mind. In Internal Communications, this will most likely be the “Head” or “Manager” of the department. The Scrum Master: The Scrum Master is the person who best knows his or her way around the Scrum process and coaches the team, as well as the Product Owner. The aim of the Scrum Master is to constantly improve the process. He or she keeps the process under control so that there are no disruptions or new tasks added in the middle of a sprint, leading the way for tasks to be finished on time. It’s important to note that neither the Scrum Master nor the Product Owner assign tasks. Scrum is a form of autonomous working in which each team member will choose and create their own tasks. The Scrum Team: The Scrum Team is the champion of every Scrum and of every company. Ideally, in a development Scrum Team, skills overlap so that team members can take on any task that’s open during the sprint and ensure that there are never any bottlenecks. That doesn't always work out for Internal Communication. For example, in the marketing department at Staffbase, we each have a different skill set. If our graphic designer is out sick, we basically cry as we struggle to figure out how photoshop works. But while tasks may be moved back into Upcoming, we eventually get everything that’s open in the sprint planning done together. The team estimates how much they can achieve during one week and tackles the tasks accordingly, resulting in an independent and effective work attitude. Scrum holds enormous potential for Internal Comms. Its framework, agile by definition, is easy to adjust to any team and task. We see four specific advantages of Scrum for Communications. Scrum makes work visible to remote teams. Especially in big companies where IC teams work in different locations, or in companies where many team members work remotely, the Scrum process makes tasks visible and manageable to all. Scrum is designed to increase productivity. When implemented properly, the process shows exactly what each team member has accomplished, spurring ambition in the team and its individual members. Additionally, once tasks for a Sprint are set, there is no room for spontaneous requests—unless of course they’re crucial. This means fewer people will be bugging you with new requests. Instead new ideas and tasks will find their place in an upcoming Sprint where they won’t distract you from the project at hand. Scrum supports an independent work attitude. Each team member is responsible for choosing which tasks to tackle and becomes their owner for the duration of the Sprint. Feelings of responsibility result in positive work attitudes, increasing the satisfaction employees have with the work they’re doing. Scrum helps to prioritize tasks more effectively. The most important tasks are moved into the “Plan for the Week” at the beginning of each Sprint. Their importance is decided by the team, and in this way crucial work is never pushed to a later point. Efficiency, productivity, effectiveness, and fun are qualities that drive teams forward, and they’re the cornerstones of our work ethic at Staffbase. Many Internal Communications teams aim to achieve the same characteristics; not just among themselves, but company-wide. Scrum is great way to blaze a path toward reaching these goals, and along the way transforming your team into a legion of communication superheroes.